Teach Laugh Plan: Techie Tuesday Giveaway! Happy Techie Tuesday Everyone (on a Monday night)! I was given the opportunity by Jenny from Learning Resources to try out the Easi-Speak Pro USB Recorder in my classroom. Wow, what a fabulous assessment tool! OK, I am going to be honest here... the first thing I did was sing in the microphone and pretended I was an American Idol (for those of you who personally know me, don't worry I was alone in the classroom). As the microphone sat on my desk and my students came in the classroom all I heard were ooohs and aaahs! My little froggies were so excited that we were going to karaoke read with a microphone. At first only my best readers volunteered. They read into the Easi-Speak Pro with a partner in my classroom library. They would listen to how they sounded and almost immediately I heard improvements of intonation and fluency. No, this mircrophone doesn't "teach" the students how to read however, once they heard their voices playback they made changes right away. Soon everyone in my class was "fighting" to use the microphone. OK, there wasn't any actual punches thrown but there was 22 kids wanting to practice their reading instead of doing anything else. I had to use it as an incentive instead of an assessment for a little bit. Here is one of my 4th grade froggies practicing her reading. I used this microphone while I was giving my end of year reading assessments. 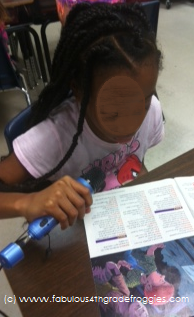 I didn't have to record everyone but it did allow me to record those students who are still struggling readers. I was able to let the parents of a few of these children hear their child read and also hear what he or she should sound like when they are reading at the end of fourth grade. I only have three and half days of school left this year....Yippee! However when I use this next year I plan on using this for our RTI meetings and to even have the kids record their reading to go along certain books. It will be so great to share the student's reading abilities with our reading specialist. I also plan on using this microphone for our oral presentations. Can you imagine how fun that would be? Too cool! Gosh, I have a ton of ideas for uses next year. Learning Resources is extremely generous and did not only give me an Easi-Speak Pro USB Recorder for me to use but is giving one of my followers one as well! WOOHOO! How awesome is that? Great giveaway! I am a Froggie follower! Love it! That will be my first purchase for next year. :0) Have a great last few days of school! I am a Froggie follower! love this giveaway!!!!!!!! you're awesome! I am a follower Thanks for the chances! I am a follower! great giveaway! I would love to win and then buy a couple more to pass around!! Awesome!! What a great giveaway! I was just talking to my grade level partner about how great it would be to have a microphone in the classroom. You're on my blog roll. What a wonderful tool for a teacher to use. Lucky you. Sounds way cool....So many uses! I am a follower. Of course, I follow your blog. You KNOW I follow your blog! Hope I win! This sounds really cool. I already follow your blog! Would love this! I follow your blog!!! so excited!! Great giveaway!! I already follow your fabulous blog!! I will be teaching 4th grade next year and am excited to be your newest follower! I follow your blog and love it!! Thanks for offering this fabulous giveaway. Thanks so much. I follow your blog. Love it too! I follow your blog! :) Thanks!! I'm a follower! Love your fantastic ideas! I follow your adorable blog. 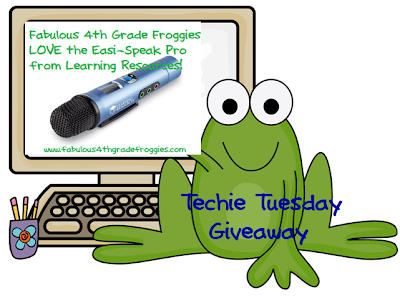 I'm a new follower of your blog and I LOVE Learning Resources' Easi-Speak Recorder! This would be a great addition to my classroom tools! Thanks for the awesome opportunity to win one. I had you bookmarked but have signed up as a follower because I REALLY want the Easi-Speak Recorder. I have been dreaming of this for a tool in my interventions. Pick me! Pick me!